Jenna Hostetler, of West Liberty, Ohio, is the daughter of Mike and Nancy Hostetler. Jenna is 22 years old and attending college. 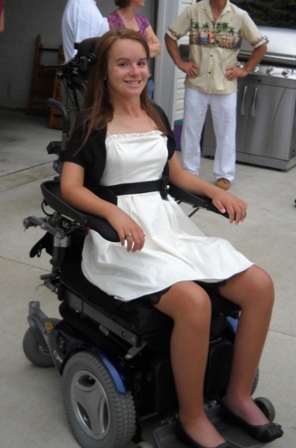 Following an accident in 2005, Jenna has experienced paralysis below her shoulders. The West Liberty community and beyond have embraced Jenna and her family through buding projects, a fund at a local bank, fund raising events and other donations to enhance everyday tasks for Jenna and her family. Nevertheless, the financial circumstance continue to be stretched beyond the ability to pay over the long-term. Although college tuition is not expected to be an obstacle, the prospect of paying for Jenna Hostetlers 24/7 personal care during college and beyond is daunting. Some churches in the West Liberty community are working together to provide a special-purpose fund that will be invested through Everence (formerly MMA) Trust Company. The goal is to raise a minimum of $1 million, from which an expected $45,000 might be paid out annually for Jennas care. With the help of caring people everywhere, we hope to give Jenna the opportunity to develop all of her God-given potential and abilities, says Art Newcomer, the former Everence (formerly MMA) counselor who is helping organize the effort. Jennas home church of Oak Grove Mennonite and other churches are involved in the effort. Anyone can send tax-deductible contributions (earmarked for Jenna Fund)to Oak Grove at 1525 Mennonite Church Road, West Liberty, OH, 43357. MMA can set up an endowment or other special-purpose fund to help provide income for your churchs mutual aid efforts and ministries, said Vyron Schmidt, the Mennonite Foundation representative setting up Jennas fund. A fund supplements, rather than replaces, regular giving, adding flexibility to your ministrys funding. Taken from MMA’s Everyday Stewardship Magazine, Spring 2010 Issue. Click on the link to view the full article. Please take a moment to view the brochure that further explains the need, the plan, and the solution to developing a way to provide for Jenna. It can be found in the left margin. Raise $1,000,000 to generate $50,000 a year for major expenditures. Funds disbursed to Jenna only at the discretion of the trustees. When Jenna no longer needs this assistance, the trustees will determine further charitable disbursement of the trust. You are invited to join Jenna’s home church, Oak Grove Mennonite, or any of the participating churches in the West Liberty community, to help reach the goal of $1,000,000. You may send your gift to Oak Grove Mennonite Church (address on home page) or see the link on the home page to give electronically through MMA.